Our practice caters to the entire family, children, and adults, where we'll check for signs of ocular disease or eye conditions as well as handle eye emergencies or removal of foreign objects. Plus, we provide co-management of laser vision correction surgery, dry eye treatment, and so much more. Our eye doctors and staff at Prairie Vision welcome you to visit our office with any question or concern. Our goal is to help you with your visual needs and keep your eyes - not just 20/20 - but healthy. Prairie Vision provides the latest in comprehensive eye exams, with advanced eye heath technology and modern techniques to ensure healthy vision for longer. Healthy vision depends on yearly eye exams with a qualified eye health professional. Routine eye exams determine the health of your visual system, in the same way that a physical exam checks your overall body condition. Even if your vision is crystal-clear and your eyes feel fine, you still need regular examinations at every age and stage of life. 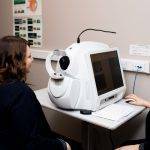 Monaco is the only UWF imaging device with integrated OCT to help eye care professionals enhance their clinical exam and improve practice economics. Early identification of a child's vision problem is crucial and pediatric eye exams at Prairie Vision are just the place for them! We use the most up-to-date technology to ensure the best eye care possible. Learn about the different types of tests and equipment you may experience on a visit to Prairie Vision. Prairie Vision has cultivated an excellent network of specialists and offers patients the benefits of Telehealth.